So why have a business card? First of all, you never know when you’ll run into someone who could be instrumental in helping you land that dream job you’ve always wanted – or even has a line on a decent job you’d like to have. Or even just someone you want to stay in touch with. You could always rely on finding a scrap of paper to scrawl your e-mail address on, because everyone can read your handwriting, right? And a pen, don’t forget the pen to write with, ’cause there is always one of those around, right? Yeah, I didn’t think so either. Let me tell you something – I write, and most of the time I can’t find a pen lying around my desk, much less at a bus stop, or the middle of the grocery store, or anyplace else I might run into someone. I buy the cardstock from a local office supply chain or my grocery store, and print them out on my laser printer at home, using a Word template provided by the paper company that made the cardstock. There are also very inexpensive options online that will print cards and ship them to you for very little money. Brian Massey, in his book The Market For Me, says that in the current career market you should see yourself as a “skills holder” rather than a “job seeker” or even an “employee”. Company loyalty to employees has never been lower, and it apparently still has not hit bottom. Especially if you are or have been in customer-facing roles, you have invested a lot of personal capital winning the loyalty of customers. It just makes sense to establish an identity for yourself beyond who your employer is this month. It is a key component of your being a skills holder, someone in demand because of the skills they possess. The back of my card has a bulleted list of skills, to remind the recipient (when they run across the card again when they clean their desk or car six months from now) that I am more than just the funny story they heard when they asked about the fishhook on the front of the card. I can hear you say, “What fishhook? I don’t see a fishhook on your card.” They never see the fishhook either, but it catches them just the same. Hook, line and sinker. Now I just have to reel them in. 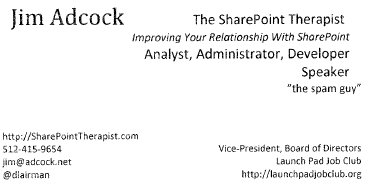 There are other fishhooks as well – my nom de SharePoint, “The SharePoint Therapist”, as well as the tag line, “Improving your relationship with SharePoint”. With these, I can talk about how I became the SharePoint Therapist, and showcase my expertise in the area of SharePoint Governance. There is also the basic descriptions of what I do – the kind of job roles I have, and my position as Vice President of Launch Pad Job Club. Finally, there are the myriad ways for people to contact me, connect with me, or find out more about me – email, phone, my blogs, LinkedIn, Twitter. Each of those last three link to each other and to even more information about me – my Google+ profile, my About.me page, Facebook, Slideshare, and more. Yes, individual who I spoke to failed to contact me when I gave him my card. But that was on him, and he missed out on the opportunities I could have sent to him had he contacted me or connected to me on one of the social media platforms. Your card, no matter how clever or memorable, isn’t a guarantee that someone will contact you. But not having one means you will miss the opportunity when they remember you but have no way to contact you. I wrote an article about DIY business cards also, and it has a link to a Word template for a 2 x 5 grid of cards. Mine doesn’t have info about text on the backside, however. Visit http://whilldtkwriter.blogspot.com/2010/10/diy-bizcards-and-name-tag.html (“DIY Bizcards and Name Tag”). I really like the idea of listing your skills on the back of the card. Thanks for the tip!